It’s been a year of changing pumps and a year of trying to change pumps. It’s been a year of talking about #WeAreNotWaiting and a year of trying to talk about #WeAreNotWaiting. Things are set to change quite soon. It’s also been a year when Amy started looping, which is all just magical. 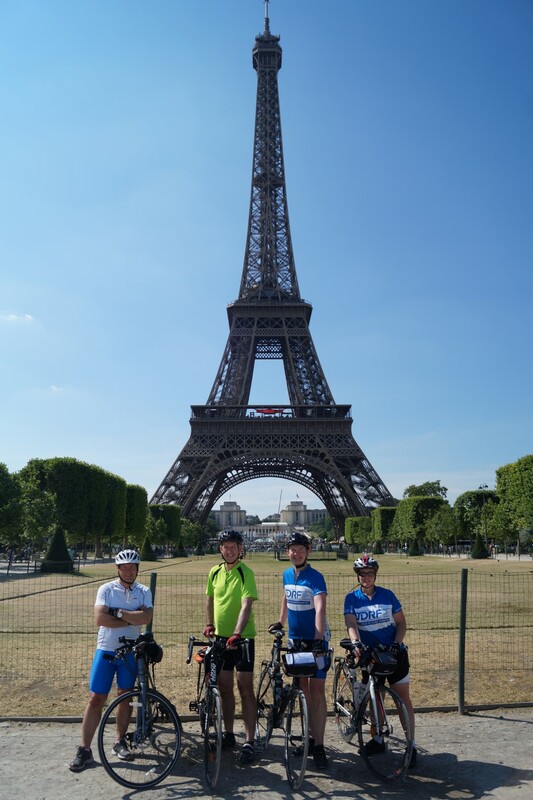 Fundraising efforts for this year topped £14,000, for the team of 12 Diabetes Dads who were part of the London to Paris cycle trip I organised this year. On its 6th birthday this blog has topped 172,000 views, despite its lack of posts this year. At the time of last year’s World Diabetes Day / Blogaversary blog Amy was using her trusted Animas Vibe pump, which at that time was 5 months out of warranty. We were waiting – ah, the irony – for the right pump to come along, for the right choices to become available. After watching mine and Dana Lewis’s talk at Rise of the Machines Amy decided that she wanted to use a DIY closed-loop system, using OpenAPS. I’d had the pump since late 2016, sat in the draw waiting for Amy to decide she wanted to use it. Within a week she was up-and-running with it and it was working well. July saw Amy start her trial of a Dana RS insulin pump for 4 weeks just using the pump and its phone app to control it, then she used AndroidAPS with the pump for another two weeks. Unfortunately the first DanaRS broke on a Friday in France, so Amy wore her backup Vibe until the new DanaRS was sent to use on the Monday. The Dana RS trial was a success. She went back to her Vibe for a couple of weeks before going back onto her Medtronic 715 and OpenAPS when she put her next CGM sensor on. In September 2017 we requested to see the DanaR pump, but with a DanaRS due to be released we decided it was be best to wait (!). I don’t want to disclose all that happened but in summary, the team were (quite rightly) wary of a pump they’d never heard about, so it took some time to convince them it was worth looking at. We had some – let’s call them – discussions which got to the point of the team thinking we would move on to another clinic. I responded with this, which became a turning point in the discussions: “there’s no way I want to consider moving Amy elsewhere, however I’m very passionate about her receiving what we consider to be the best available pump on the market“. My key message to others in this situation is: your team have a duty to make sure anything they provide is suitable; PWDs and parents have a duty to make sure their voice/opinion is heard and respected; there’s rarely a decent reason for a patient not to get the pump of their choice; there’s a rarely a decent reason for a CCG to not go with a Doctor’s pump recommendation; it just takes time and effort. Amy receives her new pink DanaRS on the 29th November. The day after WDD2017 Amy spoke at DPC17 in Olympia, her most important event so far, and alongside the lovely Philippa Cooper and Dr Sufyan Hussain. This year, between us both, we’ve spoken at 10 events, to over 700 people. Much of this is to HCPs which we do for one reason: so that it lets them know about what patients are doing so if one of their patients starts on it the HCP has a good understanding, which should help them support their patient. The most recent one for me was at the Type1AndTech conference in Swansea last Saturday and if you’re interested the sessions were videoed. Saturday’s Type1AndTech conference was a breakthrough, being the first time (I think) anyone has spoken about WeAreNotWaiting to an event organised by a UK Diabetes charity, namely Diabetes UK. The landscape is changing, hopefully thanks to all the awareness so many in the UK, like us, are giving to organisations and HCPs. Next Saturday my friend Craig will be talking about WeAreNotWaiting at the JDRF Leeds Discovery Day and I hope this will be the start of many events where PWDs/carers can talk about such technologies. I recently discovered this video again, it makes me laugh, a lot. Okay, I know, it’s really World Diabetes Day but for reasons which will become clear later I’m calling it Global Diabetes Day this year. It’s been in some ways a busy year, in some ways a quiet year, since 2016’s World Diabetes Day blog. It started with Amy and me presenting Nightscout, WeAreNotWaiting and DIY artificial pancreases to the team at Oxford in January and ends (almost) with Amy presenting with Dr Sufyan Hussain at the Diabetes Professional Conference 17 at Olympia this coming Thursday and me lecturing at South Bank university a few days later. I’ve been really pleased to meet so many teams and HCPs who want to know more about what patients are doing and one day, who knows, I might actually feel comfortable presenting. Nightscout UK had a great weekend at the Children With Diabetes Friends for Life conference in October where we used for the first time the roller banners I created. October saw Amy and I attend the QiC Diabetes Awards which I helped judge this year, walking away with a Winners trophy for T1 Resources and collecting the People’s Award trophy for my friend Sarah Davies who works tirelessly supporting families and adults who are using Nightscout. Enough about us, and back to Global Diabetes Day. On Saturday I went to the premiere of the #T1DGlobal17 video, a day for people with diabetes and carers, organised by Gavin Griffiths, who had been sponsored by Sanofi Diabetes to visit lots of different places around the world, chatting to T1 groups and doing some exercise classes and events with them. Saturday saw the premiere showing of the film of that trip but Gavin made the day much more than that, including multiple panels of people discussing different topics. I was astounded at the work being done by all (Chris, Bri, Sara, Shelley, Rebecca) but the standout for me was Jacq for the amazing work she has done with DWED (Diabetics with Eating Disorders) for people with Diabulimia, a condition some few have heard about but a condition that as a parent of a teenage daughter with Type 1 I have previously worried about. The best part of the day for me came later when Gav’s League of DiAthletes took the stage, each one telling us what life was like for a person with Type 1 in their countries of Ghana, Kuwait, Pakistan, Brazil, Costa Rica, Australia, Ghana and the Republic of California as Gav liked to call it. The stories range from good to bad but they had one thing in common: the work being done by the people for the people was amazing. Communities pulled together to help others live their lives. The world is a much better place because of the likes of Fred, Mohammad, Sana, Naty, Dani, Paula, Lucas, Nikki and of course Gav. It made me think a lot, it was very humbling. Here we are looking at which insulin pump Amy is going to get next, arguing for the pump we want rather than what the clinic have offered, having the options to try the latest insulins, deciding whether Amy prefers this cannula or that, this meter or that, this insulin or that. We moan about not having funded CGM, or currently the lack of CCGs funding Libre. At no point ever have we faced the issues that any of the League of DiAthletes face every day. We don’t need to fight for anything that Amy actually needs – not wants – to live. We are very privileged to be in this position. We are very privileged to have the NHS. And that leads me on to one of my favourite speakers from Saturday, Elizabeth Rowley who runs T1International. Elizabeth, wearing her t-shirt emblazoned with ‘Access to Insulin is a Human Right’ spoke about the fantastic work T1International is doing, about their work with the #InsulinForAll movement which has always been brilliant but even more so now with the crisis our friends in USA are facing with the cost of their insulin, a so-called rich country where people can’t afford insulin. It’s mad. So maybe this blogging was a fad after all, I’ve hardly kept it up-to-date, happy instead to read the blogs of some of the community’s new bloggers, like Amber. In fact it’s not just the blog which has taken a back seat to real life, Diabetes has too, well at least it has for Amy. Life for Amy has just been so busy at the moment, with school, with friends, with gigs, with hobbies. She’s decided to aim for the sky as far as education goes, striving to get herself into a position to apply to undertake a medical degree at one the UK’s most prestigous universities. At this stage whether she gets there or not is neither here nor there but one thing’s for sure: she has not considered that having Type 1 will stop her in her quest. With the attitude to life and diabetes she has I have absolute faith she will achieve major successes in life. November 2015 saw Amy going to strength to strength with Nightscout and her Pebble watching displaying her glucose levels. Then her Pebble broke and I never got round to fixing it. Then eventually she decided that she wanted a break from CGM when her Dexcom G4 transmitter battery died. 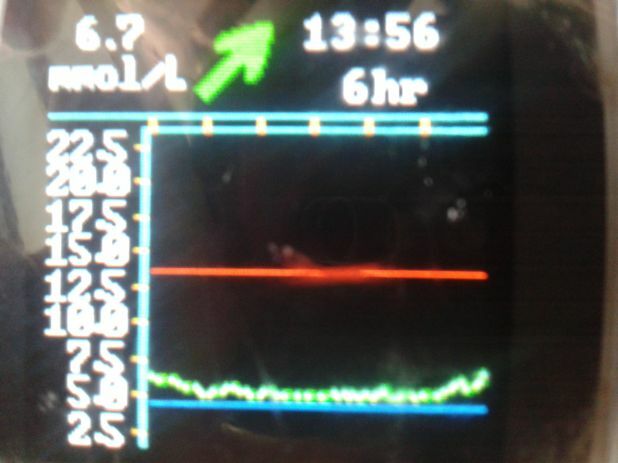 From a parental point of view and especially as a member of the Nightscout UK team I’ve found it a little difficult to come to terms with a lack of CGM data, after a couple of years relying on it. BUT, this is Amy’s diabetes, this is her choice and regardless of what I’d prefer I must respect her decision. For the moment she’s wearing the occasional Libre and this is generally working very well for her, giving her poor fingers a rest from jabbing with a lancet. Libre is enabling her to see her data and we’re taking such a back seat that I have not looked at any of her data, whatsoever. We’re so lucky that Amy is on top of her diabetes and things are going well, if she wasn’t and things weren’t maybe we wouldn’t be so relaxed, but for the time being technology is not the answer. One year ago today we were waking up to the morning after the terroist attacks in Paris. I’d taken Jane to Paris for her birthday celebrations, it was the first time we’d ever left the kids (aged almost 18 and 15) alone, so it’s darn typical we’d go on that weekend to that city. But Thank God for Nightscout, which enabled us to take that well needed break, knowing that we could see how Amy was and if needed get help to her, or nudge her sister into helping, or so on. Without Nightscout, we’d never gone away that weekend. Without Nightscout, Jane and I would never had the fantastic time we had. For me, this last twelve months have been somewhat challenging, but has brought forward some fantastic opportunities and experiences. I’ve always hated public speaking, in fact I won’t even speak up in a pub or a group, preferring instead to listen to everyone else, so the idea of doing presentations used to freak me out. After the presentations at CWD FFL 2015 I’ve launched into seeking opportunities to present Nightscout to other families and health care professionals, all for awareness only. First it was the opportunity to visit the Houses of Parliament with INPUT Diabetes for the Medical Technology Awareness meeting. Back in January, along with Stuart, Kate and Amy, we presented two long (1.5hours) presentations to JDRF and Diabetes UK, giving them a run through of everything Nightscout. A few days later I got the great opportunity to present about our life with T1 at Dr Partha Kar’s TalkT1 event, and of course slipped in a fair few slides about Nightscout, try stopping me. Then in April Dr May Ng asked me to present at the CYP North-west education day, talking about our life with Diabetes and of course Nightscout and OpenAPS got some slides too. Again in April I presented Nightscout to the National Diabetes Psychologists meeting. This year of presentations culminated with my biggest opportunity yet: presenting Nightscout to NHS England. Again this was done purely for their awareness, our Nightscout team of presenters (me, Kate, Matt) expected nothing but we got so much more – blimey, just realised I never blogged about this…must do that soon. I was amazed that my ‘let’s get a team of Diabetes Dads cycle London Nightrider‘ post on our Facebook group resulted in a team of around 30, raising close to £20,000 for JDRF. I enjoyed all the organising of this and giving us Diabetes Dads the chance to meet up. I’m also pleased to have helped my friend Kelly organise of group of 16 of us to cycle from London to Paris. Between them they raised thousands for several local Diabetes charities, enabling the purchase of CGM to help others in need. Getting Carlo to link his Libre-scanning Glimp app to Nightscout. In April as part of promoting Diabetes UK’s 100 Things book, Jane, Amy and I appeared on a local TV channel. It’ll be the one and only time I let my eyebrows get a media outing. I was really proud of Jane and Amy, they did brillantly. JDRF’s Type1Catalyst event saw both me and Amy in Parliament, unfortunately though for Amy several hours walking around Camden meant she spent most of the time in Parliament trying to get out of a hypo. I’m proud to be one of the founding members of the new T1 Resources web site. Sophie and Mike really have done a great job of organising such a great resource. Most recently I’ve enjoyed being a judge for the QIC Diabetes Awards. It hardly seems like a month ago since I wrote last year’s WDD2014 and Blogaversary 2 post but now I reflect it feels like a lifetime ago. Three years on and I’m surprised I’m still blogging, I thought my enthusiasm for this fad would have died out by now and I suppose it has a little as I just don’t seem to write so much these days. In reality the problem is time and I’m not sure that’s going to improve any time soon. World Diabetes Day for me is about reflecting on what we’ve achieved during the past twelve months whilst looking to the future about we’ll achieve, plus the advancements of medicine and tech which help everyone with Type 1 Diabetes. I can sum up the last 12 months in three easy words: Pay It Forward. I’d like to think this has always been my motto but never so much as it has been recently. It’s important to me, it keeps the world spinning in my eyes, it makes may days brighter and when in (thankfully rare) darker moods it’s the only thing which gets me through the day. So here goes for a few moments of the previous year, but first how’s Amy been getting on? Amy’s worst moment with Type 1 – Where’s Jacques? Quite recently we visited Versailles so it’s apt to think this last year was the best of times, it was the worst of times. Unlike in Dickens’s Tale of Two Cities there’s been no revolution but we’ve certainly had two episodes which came too close to kissing the guilotine for my liking. August was marred by two moments when we just took our eye off the ball and by rights Amy should have gone to hospital to quickly get her out of her nose dive towards diabetoketoacidosis. I don’t feel that proud that I didn’t take her in but we wanted to spare her the trauma, but she was scared, we were all scared and yet the first occurrence really proved what a great team our little family unit is, all pulling together for the good of Amy. That first near-DKA occurrence was a dark moment for me particularly, I’ve never felt so helpless but at the same time the education everyone in the #DOC has helped me attain meant I knew what was going on. Whilst I got lots of advice from the #DOC it was really only Andy Sherwood who kept me going through this as without WiFi or data I relied on SMS and I thankfully had Andy’s number to hand. Thank you Andy. Anyway, enough of this dark rubbish, let’s move on. In December last year I got the opportunity to help the next generation of Pharmacists learn what living as a family with Type 1 diabetes meant. I thought it went well but maybe not, I’ve not been asked back. I’ve continued my role as Peer Supporter for Diabetes UK in a slightly lesser manner than before but still get to help people via email. It’s a vital service but I just couldn’t commit any time to answering the phones anymore. On January 1st, in ‘new start’ mode I pulled the trigger and ordered up the components needed to build xDrip and get Nightscout up and running. 10 days later with it up and running I realeasd my first blog about it: #WeAreNotWaiting thanks to #xDrip – Introduction. I can’t possibly explain it here so read the above article or any of the several #WeAreNotWaiting posts I’ve done. The xDrip blog articles went wild, especially in the States and are still used by many to introduce xDrip and Nightscout to newbies. I’m quite proud of that. My involvement with Nightscout and xDrip moved on a stage when I was asked to be part of a team presenting Nightscout to many families at a conference recently. See the posts here and here or watch the videos of the presentations. My involvement with Nightscout is contuining at a pace and I hope January’s blog(s) may prove interesting and exciting. The first ever ‘unconference’ organised by Paul and Midge of TeamBloodGlucose was simply brilliant. The opportunity to meet with several of my online friends was excellent and meeting Veeny was a highlight for me but the effort Jules put in to be able to attend made her the star of the show for many of us. Later that evening we would learn that toothpaste is an unsuitable hypo treatment. It’s a shock eh? Amy spent a week in April on a student exchange trip to Germany. Not only did she nail her glucose levels sufficiently to have a great time away – some feat considering the family lived so close to the Haribo outlet shop – but she spoken German all the time, one of the few to do so, and nailed an A in her GCSE which she took two years early. May was a big month. First, Amy and I spoke a little at the National Paediatric Team Meeting in Birmingham. A super scary time speaking in front of 200 health care professionals. Then I had the most wonderful time with Chris, interviewing Dr Stephen Ponder about Sugar Surfing on behalf of Diabetes UK. Dr P is undoubtedly one of the nicest people I’ve ever met. In June I undertook the biggest cycle ride of my life, cycling from London to Paris in a self-organised and unsupported trip with friends, raising £600 for INPUTDiabetes. The full self-organised London to Paris trip blog is available here if you fancy doing this yourself. In August I rode the longest ride of my life, 100 miles, supporting JDRF and raising £430 in the Prudential Ride London Surrey 100. My blog has never been about statistics however it’s really nice to see them improve. Well I say improve, they’ve rocketed since blogging about Nightscout and xDrip. In the first year the blog had about 11,000 hits. In the second a huge increase to 27,000 that year, over 38,000 in total. In the third, because of xDrip, it’s massively increased to 52,000 hits, and a grand total of over 90,000 hits. The key thing about these numbers is that people are finding the information that matters, and that’s all that matters. It’s hard to believe yet another year has gone by in the Diabetes world, here’s a little bit about what’s been going on. But first, it’s my blog’s birthday; 2 years old today (well actually yesterday but let’s not worry about that minor fib). Its visits have doubled since the first year’s statistics: I’m pretty darn amazed with that. What really pleases me is that I can see from the stats that people have searched Google and found the answers in my site, that’s kind of why I started it in the first place. In December 2013 my daughter Emilia decided to take part in the TrialNet study at Bournemouth. It was two long months before we found out her results (and mine) were negative which pleased us, although we were saddened to hear that a friend’s result was positive. Christmas and Amy’s Diaversary (29th Dec) came and went and her 6 month old Animas Vibe insulin pump made life easier during the festive period. Early in the new year I started my shifts as a national peer supporter for Diabetes UK, answering phone calls once a week and helping people find solutions to problems, or giving them ideas from the experiences we’ve had in the family. It’s proved to be really rewarding. March was a whirlwind on a particular day, the 15th, which saw us have two back-to-back diabetes events, doing their impressions of buses and policemen (none around, then there’s two). The first was an education day held by the local Type 1 families group Seahawks where amongst many other things I got to check out Roche’s latest pump, the Insight. It a great event and I was sad to rush away from just after lunch. But rush we must as Amy was doing a sponsored Indoor Skydiving in aid of JDRF along with lots of kids we knew pretty well; she loved it, every minute of it. In May I joined in with blog week and I remember how nervous I felt when releasing my poem for Tuesday’s entry: A Childhood All Gone. It turns out I needn’t have been so nervous and I think that’s turned out to be my most favourited/Retweeted/Liked blog post ever. Earlier in March Animas got the green light for use of the Vibe pump with Dexcom CGM for children, something we’d be waiting for since June the previous year. One year after getting her pump Amy went live with CGM and what an eye-opener that turned out to be. June also saw me cycling 100km around London overnight with a group of friends in the Nightrider charity event, where my local group of 8 raised £2700 for JDRF. On the plus side the training for it and switching to a healthier diet has also seen me shed 1.5 stone. My personal highlights for this last year though involve each one of my kids. First Amy spoke in front of hundreds of Paediatric Health Care Professionals in a transition chat set up by the wonderful Dr Kar from QA Hospital in Portsmouth. Secondly, it was Emilia’s prom and a combination of pride and tiredness (from Dad-taxi pick ups at 3am) made me quite reflective: The Forgotten Sibling. Quite a lot has changed since last year’s World Diabetes Day and the release of this blog but one thing hasn’t changed: my desire to take photos of buildings lit up blue to raise awareness of Diabetes. Luckily fate had it that my boss wanted me to attend a seminar in London and it happened to fall on World Diabetes Day, today. With the seminar finishing at 2:30pm I had the rest of the day to myself. I had a form I needed to drop off to Diabetes UK headquarters so off I headed to Camden and met with Lucy who’s heading up the Peer Support group I’m joining soon. I wanted to meet with Amy who heads up the social media for D:UK but she was busy helping with a Google Research Hangout with Dr Yuk-Fun Liu, something I’d sent some questions in for yesterday. Afterwards Lucy took me up to meet Amy who gave me the biggest hug of anyone in the #DOC so far. Today marked the first time where any members of our family actually did anything connected with World Diabetes Day. Last year should have been the first but we didn’t know about it, only Twitter made sure we knew about this one. I set off at 7:30am to drive to the Queen Alexandra Hospital on the top of Portsmouth which marked the start point of the DiabetesPower ride from Portsmouth to Birmingham, a mere 150 or so miles over two days! I arrived dead on 8am, thirty minutes before Angela (@diabetespower1) and her team of cyclists were due to leave, but where were they? I couldn’t find them. After walking around the QA I eventually found them. Angela and I found a few minutes to have a nice chat – we’d never met before – before the hospital’s communication team and the local newspaper turned up for a photo session. It was great to meet them all and hear about DiabetesPower, but I didn’t envy them, especially knowing the route they were taking had some pretty big hills. Here’s a shot of the team getting their photo taken. My route to work took me past the team tacking the first few hundred yards, up the steep Portsdown Hill to the north of Portsmouth. I stopped at the top to cheer them on. Here’s a picture of Angela nearing the top, with Portsmouth and its Spinnaker Tower in the background. During lunch time at work I followed all the tweets that were going on and was amazed to find out about Ninjabetic’s article for The Independant about Diabetes UK’s 4T’s initiative. What a great idea that is and so simple to remember: tiredness, thirst, thin and toilet. Tomorrow I’ll print out their poster and get some put up in the local schools and nurseries. After dinner and we decided to pop out to see the buildings being lit up for WDD2012. First to our nearby Southampton where we found the building that was meant to be lit up, and it was, but it was white. What! That’s Rubbish. 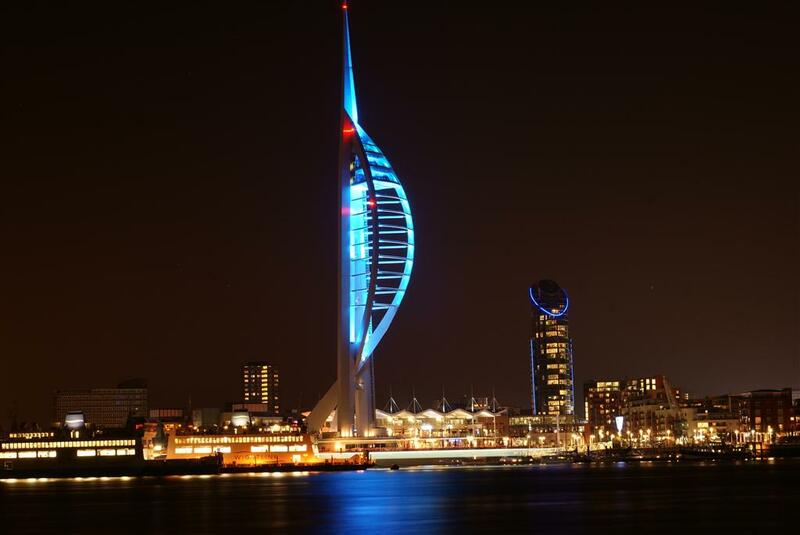 So, off to Portsmouth to view the Spinnaker Tower which was glowing blue for all to see. A twist of irony saw me ending the day supporting Portsmouth rather than Southampton, but only the council, not the football team. No way would that happen.